A section of Argyle Street in downtown Halifax is getting a trial makeover with new seating, blue paint and palm trees as part of a redesign to accommodate more pedestrians and cyclists on the street. 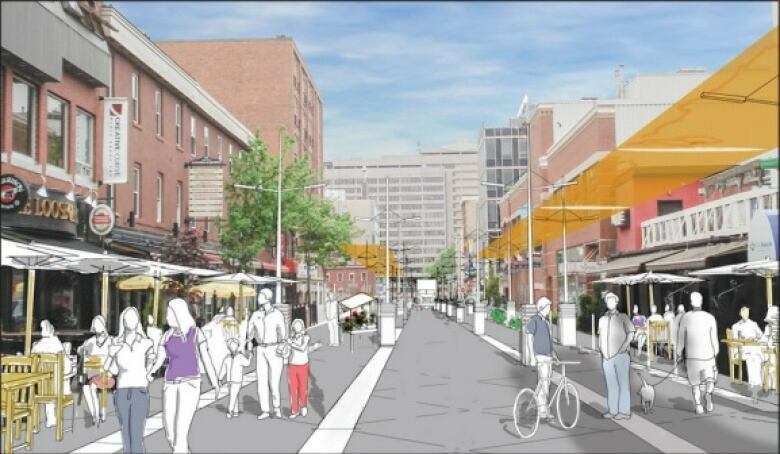 The Argyle Streetscaping Pilot Project, which was approved by Halifax regional council in March, will change the right of way for traffic between Sackville and Blowers streets by narrowing car lanes and widening sidewalks. The changes, which include painting the street pavement blue, are temporary. City planners see the pilot project as a new strategy to try to attract more people to that part of downtown. "We looked at this block because we wanted to find somewhere the temporary patios had been put out for almost 20 years now, and we see that as a real bellwether of how people want to use the right of way," said city planner Jacob Ritchie. The project is budgeted for $20,000, but Ritchie doesn't think the project will cost that much because most of the materials they'll use have been sitting in storage for a while. "The paint job will take a few days, but you know, we're talking about interventions that really are with materials we already have in house," he said. "The process is really just getting them deployed on the site." The changes are planned to be completed by July 26. 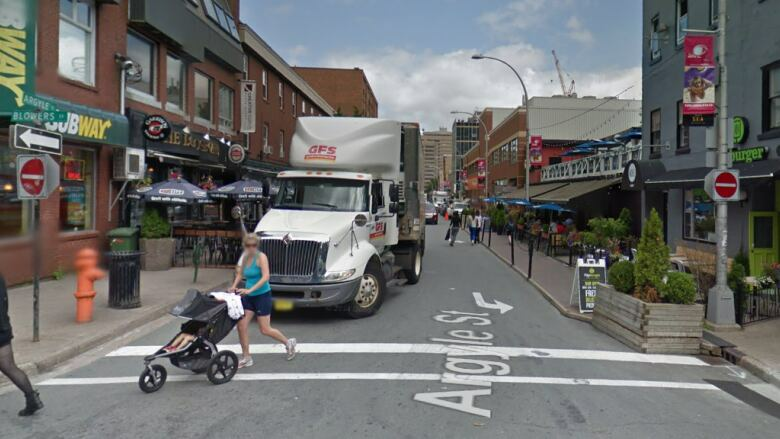 Even though the project will add more construction to the site — which is already dealing with the large-scale construction of the Nova Centre — over the next week, Argyle Street business owners are supporting the project. "I think it's fantastic," said Mike Leigh, manager of the Bitter End. "The idea of painting the street is really just to wake people up to the idea that something is really going on." Leigh says he doesn't expect business operations to be affected negatively in the short term, and says the city is smart to incorporate transitional changes to blend the old look of downtown with the eventual aesthetic of the Nova Centre. "Down the road, there's going to be a huge growing pain because once they decide what the final look will be, they will have to rip up the sidewalks, streets and everything else here and I believe that is scheduled tentatively for the fall of 2016," he said. Leigh says this project should shine a light back on the street, which has lost some foot traffic over the last few years. "Anybody that walks downtown, or works downtown, or hopefully lives downtown — they should love this. It really is going to become a new destination."